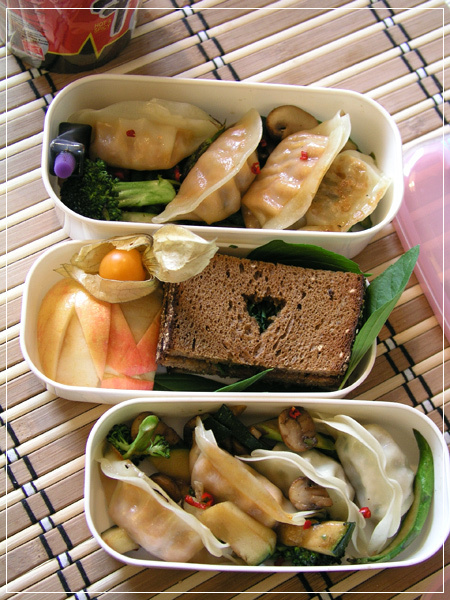 I am really looking forward to this month being over, not only in terms of work but also because then maybe I’ll have time to make pretty-looking bentos again! I made veggie tortillas tonight and packed the leftovers. Big bowl (right): stirfried broccoli, asparagus, sweet corn, brown champignons, bell pepper, leek, red onion and grape tomatoes (mmm leftover veggies), a few carrot strips and some cheese. Small bowl (left): More carrot strips, homemade guacamole, grated cheese and (storebought) salsa rolled up in some carrots as separator, and some grape tomato pieces. Dessert: Pocky and a chocolate my grandma sent me. I am taking a (storebought) corn tortilla too, but since I don’t want it to be soggy, it’s rolled up in aluminium foil. You can see it on the right of the picture, but it’s not pretty so I left it out of focus. Veggie tortillas are really easy and quick, but incredibly tasty as alternative to meaty or soy-meat filled tortillas. In fact, I prefer them to both alternatives – I like my tortillas filled with chunkier stuff than meatsauce, and am always a bit suspicious towards meat replacements (the last soy-tortilla stuffing I bought was awful!). The trick is to stirfry the vegetables in a very hot (preferably castiron) pan or wok, and not to salt them until last – I find salt makes them release their juice and makes the whole thing soggy. Good vegetables to use: red and yellow bell peppers, zucchini, leek or onion chunks, sweet corn, beans, champignon mushrooms, eggplant (and anything you might have left over, see above). Spice with: freshly-ground pepper, chili, garlic, freshly-chopped basil leaves. Sauces and condiments to stuff the tortilla: Guacamole, sour cream/yoghurt, hot salsa, grated or shaved carrots, romaine lettuce, grated cheese (any yellow cheese will do). I have to come in to test the network at work tomorrow; so I packed some bento for my BF and me to go out and eat it in nature later. and average joe crabstick, avocado, leek and mayo rolls. Kimbap is a Korean type of rolled sushi that is usually stuffed with a lot more, varied ingredients than Japanese maki. I have seen as ingredients everything from any pickled, raw or fried vegetable you can imagine to even ground meat. They are usually large and hard to eat in one bite – it takes some training to eat them without spilling! My Korean friend that introduced me to sushi/kimbap used to make rolls with pickled white cucumber, spinach and carrot. I have since then experimented and found that very thinly sliced fried or roasted eggplant, sweet omelette and spinach with sesame seeds make excellent “savory” stuffings, to which you can then add several of the ingredients that are less intensive in taste, like carrots, cucumber or radish. I’m all for fusion food. This morning I hadn&apos;t planned a bento and was on my way out the door when I realized that I had meetings all through my lunchbreak! saved my day by posting hints on quick bento staples! Two ricicles (I couldn&apos;t resist) – frozen onigiri, one with gochujang mixed in. I made a batch on the weekend – also some yaki onigiri, but they sadly don&apos;t seem to be my thing. 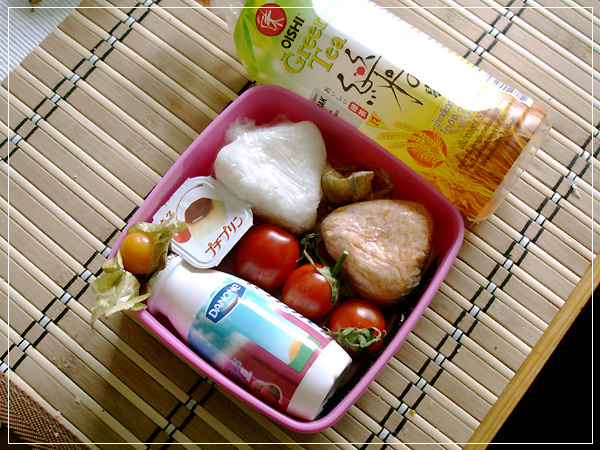 Read how to make them in ss_biggie&apos;s speed bento blog. My ricicles are all hand-formed – I don&apos;t have onigiri shapers here, but I have started to get the hang of handforming the little triangles. They get a little bigger than Japanese ones – my hands are so big! But the angles are quite the same – I found that with the right hand position, the shaping happens on its own and all you need to do is to twist the riceball around three times. Also in the box: The last of the neverending box of physalis, three grape tomatoes, a minipudding, a yoghurt and some nori on the side for the riceballs. By the side is some green tea drink (which seems to be actually barley tea with “green tea” taste) that I found in the Asian supermarket on the weekend. I&apos;m not quite sure I like it – barley tea on its own is an acquired taste, but I find that the lemonade is rather too sweet for my taste. I rarely drink lemonades or sweetened drinks, so this came as quite a shock. 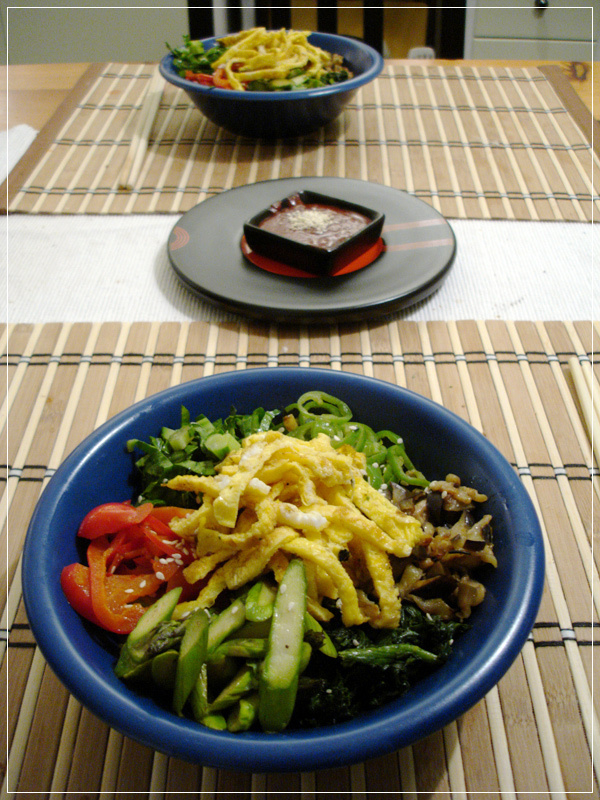 Bibimbap is a Korean rice and vegetabe dish. It&apos;s super easy, but I somehow never managed to find the sauce. Somebody in mentioned the name of it – Gochujang! I was able to find it at the Asian grocer in town today, and if you do a Google image search on it, you will see it comes in a lot of different packages. I like to visualize the packaging since I can&apos;t read either Korean or Chinese and only a very tiny bit of Japanese (mostly hiragana and katakana). The recipe is really easy: Here&apos;s the bentolunch thread with the traditional veggies. and sliced sweet omelette on top, because I like that better than sunny side up. The vegetables are all quickfried with garlic in a little sesame oil. Every vegetable is fried separately to be able to add individual spicing (salt and sugar), but mainly to keep them in separate heaps for arranging them on the rice! How to eat: I used the sauce pure, because that&apos;s what I&apos;m used to. Traditionally, it should be mixed with some soy and additional spices to make chogochujang. In the restaurant that I used to go to, the rice was served in hot castiron bowls that had a little oil in the bottom so the rice got crispy. The gochujang sauce is served separately in a little bowl. You take as much of it as you can stand (it&apos;s a spicy chili paste, and if you use hot iron mugs, it will get even hotter as it gets warm) and mix it in with the veggies and the rice. 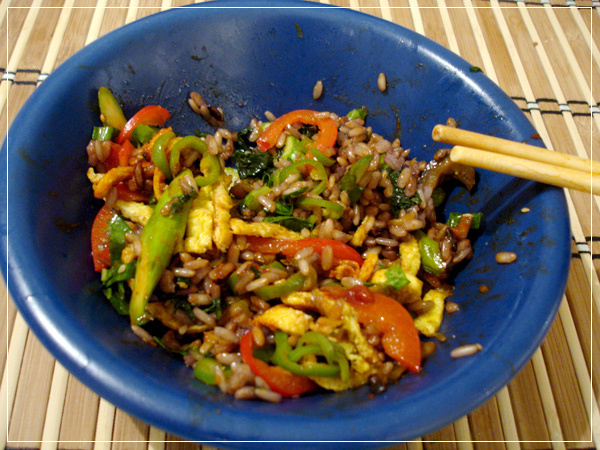 The rice is purplish because I used brown rice with a few grains of purple rice for color. It&apos;s all about the colors! The plantation on my windowsill is growing under the loving care of (mostly) my bf. We repotted all of the herbs in self-watering pots so they can survive while we are away. Making self-watering pots is really easy and totally worth the effort! 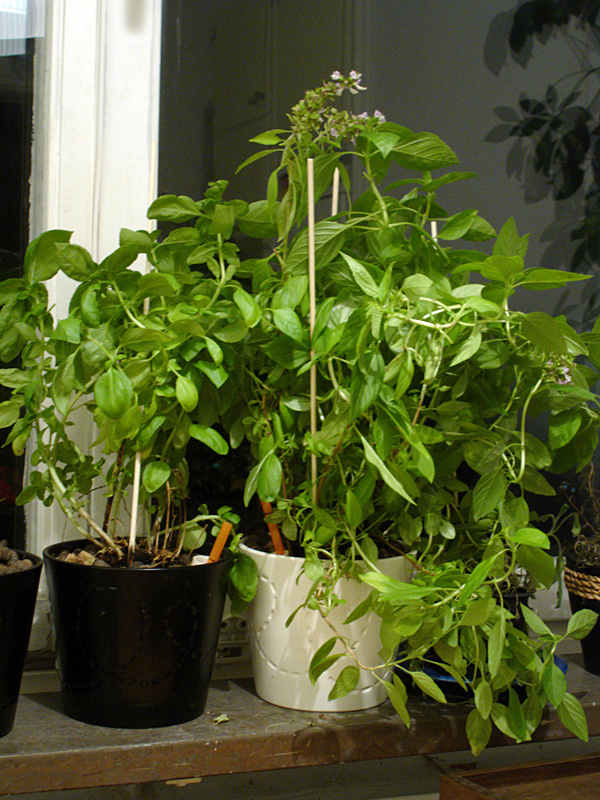 On the left is a normal basil, and on the right Thai basil. That plant grows like a weed! It&apos;s incredible! I also bought a rosemary recently, but it died pretty quickly. Apparently with store-bought herb rosemary you&apos;re supposed to take it out of the ground it comes in immediately and give it much drier, leaner ground. The next time I bought one from the gardening shop and it thrives just great in sandy ground! Interestingly, the seeds we bought were rather low in quality – the stuff that grows well is from dried and preserved seeds. Sadly, the seeds I had left over from my first chili plant didn&apos;t make it – they were frozen and don&apos;t seem to have survived. Now we have two plants from dried banana chilies (rather mild), two from the storebought seed with unknown strength, and possibly some from a Chinese spice mix. 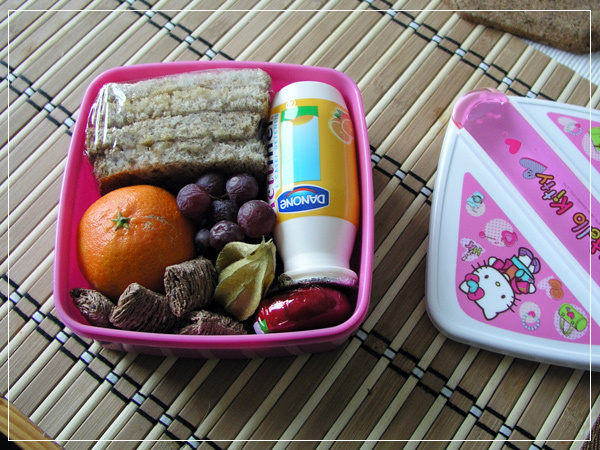 Not much going on bento-wise for me recently because of work-related stress and general end-of-winter tiredness. My stomach was feeling the neglect… so it demanded light, non-fatty food today! Middle layer (breakfast): Two apple bunnies, a physalis, toasted dark bread sandwiches with butter and chives – one of my childhood favourites! This breakfast includes everything we used to call a “feel better” meal except for a cup of hot cocoa – apples and dark bread with butter and chives is wonderfully homely and reminds you of spring! I should remember to grow my own chives again, as frozen ones don&apos;t compare. In the upper corner of the photo is a cup of emergency noodles in case I had to work late and got hungry, but I didn&apos;t need it. Yes, I love all kinds of filled pasta, why do you ask? The supermarkets here have their own brand of fresh (non-dried) pasta that is rather tasty and easier than making your own tortellini. 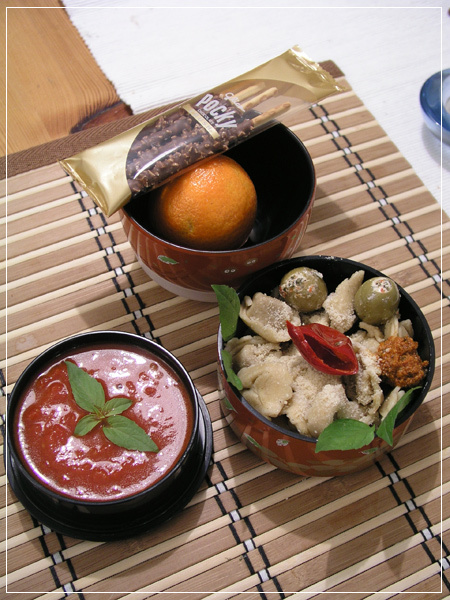 The wholeweat version has the added benefit of being a lot more filling than this kind of pasta usually is – perfect bento food! The tomato soup is homemade and a perfect speed recipe. It&apos;s not much more than crushed tomatoes, some tomato concentrate to reduce the liquid, a bit of butter, salt and sugar and lots of herbs. Of course, the longer you let it cook the better it gets, but it is a really nice and speedy sauce/soup for whenever you are too hungry to cook much as well. Dessert: A tangerine, almond crush pocky. The were rabbits like to play with their food. I got most of my inspiration from Indigo, who make delicious vegan sushi. Since I am a bit worried about having raw fish at home (I wouldn&apos;t be able to tell if it was still good, let alone cut it) most of my at-home sushi creations are vegetarian. The only fishy ingredients I use are smoked salmon and crabsticks. But vegetarian sushi is surprisingly good and a very good food to give to beginners! They contain asparagus sliced diagonally and lightly fried in olive oil; dark champignons (I sliced them after frying for artistic value – I would prefer shiitake I think, but they are hard to come by here), and zucchini slices. After frying the zucchini and mushroom I quick-cooled them with a little vinegar, which brings out the taste and fits sushi perfectly. You can do the same thing to bell peppers for a tasty tapas food or more sushi variants. Also on the plate are pickled ginger, wasabi and sliced leek with a dab of mayonaise. The leek isn&apos;t particularly Japanese, but does fit vegan and crabstick sushi really well! Note to self: I need to find a recipe to make my own pickled ginger, as I am not too fond of the taste of aspartame. The tea is genmaicha, which is a Japanese green tea with sesame-tasting ricepuffs in it. It is delicious! Here&apos;s to hoping the next week gets better!